LOS ANGELES, Dec. 11, 2015 /PRNewswire/ — AXS TV expands its music programming lineup with the all-new original series ROCK & ROLL ROAD TRIP WITH SAMMY HAGAR PRESENTED BY MERCURY INSURANCE, premiering Sunday, January 24, at 9 p.m. ET/6 p.m. PT. The six-episode series features all-star guest appearances and unforgettable performances, as the Red Rocker drives across the country to jam with some of music’s biggest names. ROCK & ROLL ROAD TRIP WITH SAMMY HAGAR is part of AXS TV’s fully-loaded Sunday night music block, which also includes the fan-favorite concert series LIVE FROM RED ROCKS at 8 p.m. ET/5 p.m. PT, and the all-new music competition series BREAKING BAND at 9:30 p.m. ET/6:30 p.m. PT. ROCK & ROLL ROAD TRIP WITH SAMMY HAGAR delivers the ultimate backstage pass, as Sammy Hagar guides viewers on an intimate and unforgettable journey celebrating all things rock n’ roll. Throughout the season, Hagar travels to the homes of some of rock’s biggest personalities and best-loved artists, interviewing them, jamming with them, and exploring their favorite haunts. The series will also present Hagar’s own adventures as he rehearses with his new all-star group The Circle, shares his rules of the road, and rocks on tour and at festivals including Carolina Rebellion. In the series’ first two episodes, Hagar and former Van Halen bassist Michael Anthony cruise the Sunset Strip and reminisce at the world famous Whisky A Go Go, before heading out to Motley Crue star Tommy Lee’s house to cook, talk, and perform rock staples “Rock Candy” and Jeff Beck’s “Going Down.” Then, Hagar heads out to San Francisco for a special Grateful Dead episode, joining founding members Bob Weir and Mickey Hart as they relive the glory days of the Peace & Love Movement on Haight-Ashbury, delve into their musical influences, discuss what made the Grateful Dead so special, and bring the house down with a Hagar/Weir duet on the Grateful Dead classic “Loose Lucy,” followed by a jam session with Hagar and Hart. Other season one highlights include a Seattle session with Heart front women Ann and Nancy Wilson, and appearances by shock rock icon Alice Cooper, Alice In Chains axe-man Jerry Cantrell, and many more. Not only is the series breaking new ground in performance collaborations and first-person commentary, but it also is the first AXS TV original series to be sponsored. Mercury Insurance, one of the nation’s top auto insurance providers, is continuing its support of AXS TV’s event programming by partnering on this show. Last year, Mercury Insurance was the Official Broadcast Partner of the network’s live music festival coverage. AXS TV is one of the cable industry’s leading event entertainment networks. Launched in July 2012 by visionary entrepreneur Mark Cuban, AXS TV is dedicated to providing groundbreaking music programming, stand-up comedy performances from today’s top comedians, and hard-hitting mixed martial arts promotions. The network’s franchises include THE X FACTOR UK and NASHVILLE; as well as original programs such as THE BIG INTERVIEW with Dan Rather; ROCK & ROLL ROAD TRIP WITH SAMMY HAGAR; BREAKING BAND; THE WORLD’S GREATEST TRIBUTE BANDS; GOTHAM COMEDY LIVE; AXS TV FIGHTS; and INSIDE MMA. AXS TV is a partnership between Mark Cuban, AEG, Ryan Seacrest Media, Creative Artists Agency (CAA) and CBS. The network is available in the United States via AT&T U-verse, Charter, Comcast/Xfinity, DIRECTV, DISH, Suddenlink, Verizon FiOS, and other cable, satellite and telco providers, including members of the National Cable Television Cooperative. The network is also distributed in Canada, Mexico and the Caribbean. For more information, visit the website, http://www.axs.tv; go to the Facebook page here and follow the company on Twitter, @axstv; on Instagram; Tumblr; Cyber Dust and YouTube. I am too. Looks very interesting. Will someone be able to put this onto a DVD ? I’m also very keen to get a copy anyone planning to put it onto DVD ? AXS TV expands its music programming lineup with the all-new original series “Rock & Roll Road Trip With Sammy Hagar”, premiering Sunday, January 24 at 9 p.m. ET/6 p.m. PT. The six-episode series features all-star guest appearances and unforgettable performances, as the Red Rocker drives across the country to jam with some of music’s biggest names. “Rock & Roll Road Trip With Sammy Hagar” is part of AXS TV’s fully loaded Sunday night music block, which also includes the fan-favorite concert series “Live From Red Rocks” at 8 p.m. ET/5 p.m. PT, and the all-new music competition series “Breaking Band” at 9:30 p.m. ET/6:30 p.m. PT. 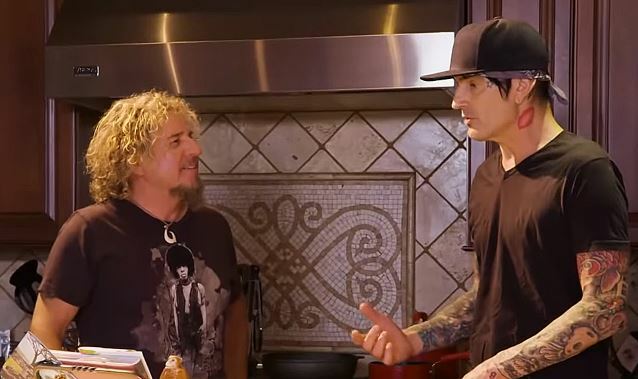 A new preview clip from”Rock & Roll Road Trip With Sammy Hagar”featuring MÖTLEY CRÜE drummer Tommy Lee is available below. “Rock & Roll Road Trip With Sammy Hagar” delivers the ultimate backstage pass, as Sammy Hagar guides viewers on an intimate and unforgettable journey celebrating all things rock ‘n’ roll. Throughout the season, Hagar travels to the homes of some of rock’s biggest personalities and best-loved artists, interviewing them, jamming with them, and exploring their favorite haunts. The series will also present Hagar’s own adventures as he rehearses with his new all-star group THE CIRCLE, shares his rules of the road, and rocks on tour and at festivals, including Carolina Rebellion. In the series’ first two episodes, Hagar and former VAN HALEN bassist Michael Anthony cruise the Sunset Strip and reminisce at the world famous Whisky A Go Go, before heading out to MÖTLEY CRÜE star Tommy Lee’s house to cook, talk, and perform rock staples “Rock Candy” and Jeff Beck’s “Going Down”. Then, Hagar heads out to San Francisco for a special GRATEFUL DEAD episode, joining founding members Bob Weir and Mickey Hart as they relive the glory days of the Peace & Love Movement on Haight-Ashbury, delve into their musical influences, discuss what made the GRATEFUL DEAD so special, and bring the house down with a Hagar/Weir duet on the GRATEFUL DEAD classic “Loose Lucy”, followed by a jam session with Hagar and Hart. Other season one highlights include a Seattle session with HEART guitarist Nancy Wilson, and appearances by shock rock icon Alice Cooper, ALICE IN CHAINS axeman Jerry Cantrell, and many more. When you’ve been rocking as long as Sammy Hagar has, you make a few friends along the way. So the Montrose, Van Halen and Chickenfoot vocalist decided to ring some of them up for his new AXS TV show Rock & Roll Road Trip With Sammy Hagar. The first season, which premieres Sunday (Jan. 24) at 9PM, finds the speed limit scofflaw and spirits purveyor exploring different cities with help from rockers who call those places home. We recently sat down with Hagar, fresh from a vacation in Cabo, to get the details on the show. Q: So did you come up with the concept or did AXS TV come to you? A: I decided I wanted to do a TV show and [co-founder of AXS TV] Mark Cuban has been kind of a friend forever so I put word out to his guy and said, “Can you guys let me do a show?” And they said, “What do you want to do?” And I said, “I just want to go around and visit with my friends.” It was the easiest way to do it. And my idea was, at the end of the show, to play an acoustic guitar with them, one of their songs, one of my songs. Like, Bob Seger, I’ll sing “Night Moves” with you, you sing “Plain Jane” with me. Q: Cool! Is Seger going to be on the show? A: I hope so. I dug at him real hard and he wasn’t around when we were filming these shows. Bob’s an old friend but he doesn’t like TV. I don’t either. But I want [Bruce] Springsteen, I want all the guys. So I went to my closest friends and got the six shows we needed and it kind of morphed. Every one of them is a little different now. I don’t think we have a specific format. The format is Sammy Hagar goes to their home or wherever they choose to do it — meet ‘em at a bar somewhere, I don’t care — and we talk. And then I sit and reflect on what they were like afterwards, and before we finish all that we play music whether it’s with a band or acoustically. Jerry Cantrell and Nancy Wilson and I on the Seattle scene, we all just played acoustically and we all played each other a new song we’re kind of working on, so it’s really artsy-fartsy and all that too. [Laughs] What I think the hook is is that I know these people and if you’re a fan or you’re just a journalist and you’re going to sit down and interview Jerry Cantrell, he’s not going to tell you certain things. Q: That was the first thing I thought when I watched the pilot with Tommy Lee. You really got him to open up. All that stuff about his youthful love of Pat Travers and Donny Osmond, who knew? Q: The first episode features you and Tommy cooking in his kitchen, will that be a regular feature? Q: So Michael Anthony is in the first episode, is he your sidekick throughout? A: Michael is my sidekick in life. [Laughs] So yeah, I think he’s in another one. Q: As far as songs go, you and Tommy play “Rock Candy” and that’s just what he wanted to do and if he wanted to play something else you would have? Q: Have you seen Live From Daryl’s House? The structure is somewhat similar but a little more regimented. A: Yeah, I did one. They came to Cabo. I love that show. I wanted a looser format, as much as I love that show. I want the chemistry between me and that person not to be neutralized. Like he does it in the same place and he wanted me to do it and I said, “Come to Cabo, I don’t want to go to that barn in your house because then it will be just like all the other shows.” I’m a nut like that. I can’t stand to do the same thing twice. So when I interview someone in their environment it’s going to take the show on this trip. And I want to get some twisted people too, I don’t want to just keep doing rock stars. Q: Who is your dream person? A: Well I’m pissed off because Dan Rather already got him, I want [Quentin] Tarantino and make him make me act or something. “You’ve got three minutes, direct me!” It’s got to be successful first but then I’m going to go for that. Q: Die-hard Red Rocker fans from Montrose on will obviously be interested, but do you expect people who think “Sammy Hagar: ‘I Can’t Drive 55′ and Van Halen” will see you in a new way with this show? A: That’s why I’m doing it. I want to just be myself. I want to shed my rock star guy. I love it but I’m not a rock star anymore. I’m just not. I’m a singer, I’m a musician, I’m everything I’ve ever been but I just don’t get dressed up and go do the funny things. (Laughs.) Stupid things. Q: Will there be another cookbook? A: Not another cookbook but another book, I’ve got another one in me. A: It’s going to be more memoir but it’s going to be about spiritual things and psychedelic experiences — not drug, but drug too! But just mainly about my belief in aliens and ghosts and my spirituality. I have beliefs that I think could help other people. I can tell you how to be happier in life. The “Three Lock Box” to living. A: That’s right. That’s it, have fun, live life. That’s what the book is going to be about. Look, I’ve got goosebumps so you know I’m going to do it! Q: Where are you at with any of your various musical groups in terms of recording and touring? A: Well recording is a tough thing because there really isn’t a recording business anymore, I don’t care what anybody says. I record to write new songs so I can go out and play them. But the Circle, [Hagar's project with Anthony, Jason Bonham, and Vic Johnson] is my favorite band in the world right now. It’s a greatest hits live band and we’ve got the pot of gold because Jason adds the Led Zeppelin in there besides my stuff with Van Halen and all that. But I don’t know if I want to make a record with that band because of the expectations, because how are we going to top our set list? You put a new song in the middle of “Whole Lotta Love” and “I Can’t Drive 55″ and it’s going to go in the toilet. [Laughs] So I think we’re just going to be playing shows. And Chickenfoot just recorded a new song. I just want to keep playing music my whole life. Q: Will there be a second season of Road Trip if this one does well? A: Absolutely. I have to do it. I’ll stick ‘em up! I’ll pay ‘em off! Q: Mark Cuban has a lot of money, he should be paying you. I’m going to dvr it. sbnitro: I’m going to dvr it. Cool bud might grad a copy from you….. This show looks fun! I dont have any of the channels it’s on! LOL 90000 channels and the web, but not that one. Too funny. Can’t wait to see this one though!